2019 is an election year in the federal parliamentary three-year cycle. Immigration is likely to be blown up out of all proportion as an election issue. One idea already thrown up by the Morrison Government is forced regional migration as a condition of entry into the country for some migrants. This is nothing new in Australia’s migration history. At its core, such policies by parliamentary parties are designed to provide cheap, compliant labour to various sectors of the economy. Going hand in hand with such policies have been the slave labour type schemes enforced on First Nations peoples. South Australia, the colony set up by small ‘l’ liberal British imperialist interests was not immune to policies designed to provide cheap labour sourced from new migrants, particularly in agricultural areas. In the 1870 -1900 period, Irish single women were promised a life of ‘milk and honey’ as domestic workers on farming properties, particularly in the south east farming and grazing region. What is perhaps less well known is South Australia’s British Farm Apprenticeship Scheme started just before the “war to end all wars” of 1914-18. The SA Government at the time adopted a government apprenticeship scheme model previously trialled by imperialist Thomas Sedgwick in New Zealand and Canada. According to researchers Oppenheimer, Anderson and Paul in their book “South Australia On The Eve Of War”, the scheme “outsourced the government’s financial commitment to the state’s farmers” rather than a state government invested training farm that would educate young migrants before they looked for employment on farms in the state. The apprenticeship scheme required no upfront payment by the farmers and required the apprentices to stay with their masters for the duration of usually a four year contract. The Peake Liberal Government of the day lauded the scheme as superior and cheaper than an adult migration scheme and thought that the lack of experience in farming work of the apprentices would enable the farmers to mould them to get the labour they wanted at cheap rates. A brochure put out by the government did not gild the lily when it described the type of work as “hard, dull and monotonous at times...scattered and distant from towns”. In 1914 though, a severe drought, outbreak of WW1 and high unemployment collided to force many of the apprenticeships to be declared null and void. Many of the young apprentices were forced to stay on the farms to work for wages far lower than the legal minimum adult wages for agricultural labourers. Others left the farms and looked for labouring work such as cutting wood or building dams on the Murray River. Some wanted to return to England but there was no assisted passage back to “the home country” for them so they were stuck in poverty in Australia. What has all this got to do with Australia in 2019, more than 100 years later? The imperialists who rule Australia today and their parliamentarians who manage the system for them, have refined their cheap labour schemes over the years with ever changing visa schemes which “encourage” new migrants to “behave” to have any chance of permanent residency or citizenship. Any “undesirables” among migrants on visas of one type or another are sent back to their country of origin no matter what fate awaits them there, rather than as in the early 1900s, forcing them to ‘sink or swim’ in their new ‘home’. 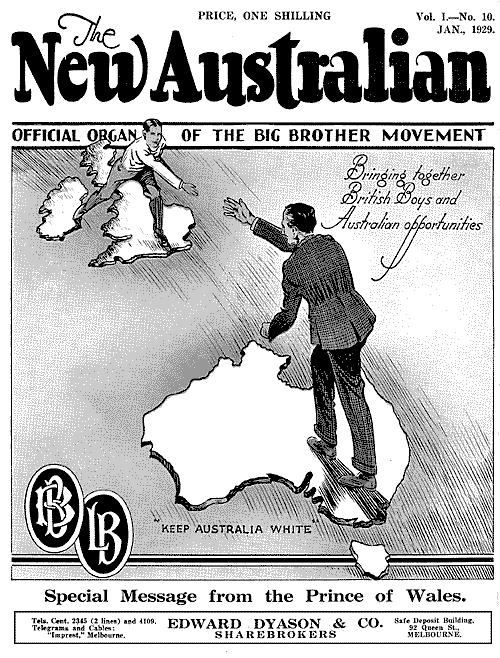 In essence though, the migration schemes of the early 1900s and those of current day are worked out by the imperialists and the governments of the day on the basis of what in their view will best assist the maximisation of profits and accumulation of wealth to the minority owners of capital. It is worth keeping this in mind as Australians will be exposed to all sorts of migration scheme policies by parliamentary hopefuls between now and the federal election which will probably be in May this year.